While this insulating sleeve was specifically designed for the Press-Bot coffee press, it works great for cold drinks, too. 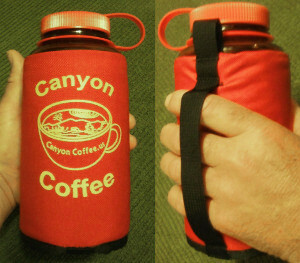 The ballistic shell of the Canyon Coozy is made of super high-grade Cordura, suited for decades of durability. Closed cell foam provides an impenetrable thermal barrier between hand and beverage. Bar-tacked for extreme strength. The one inch webbing used on the hand-grip and ‘biner-loop could save your life. Great for a hiking, running, boating, camping, all-around rad lifestyle.